Before I begin this last minute costume DIY I should mention that technically this isn't a true candy corn pattern. 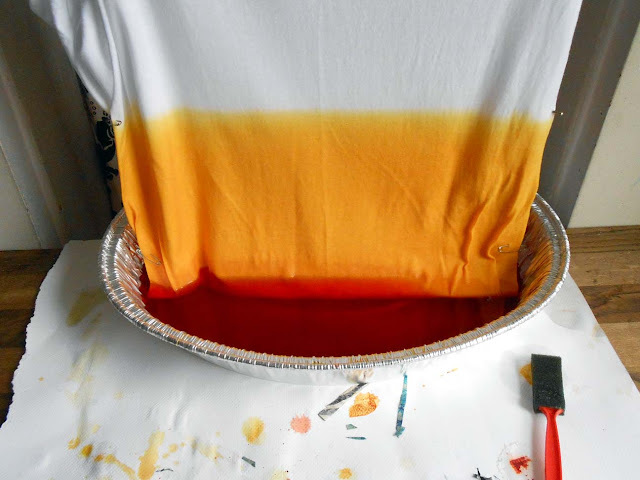 The orange should be on top and the yellow on the bottom, but having the darker of the two colors up top doesn't work for my layered dip dying purposes. So be it! 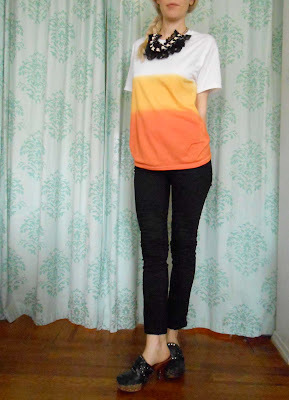 The colors are out of order, but probably no one will notice (except candy corn purists). Step 1: Set up your dying area. 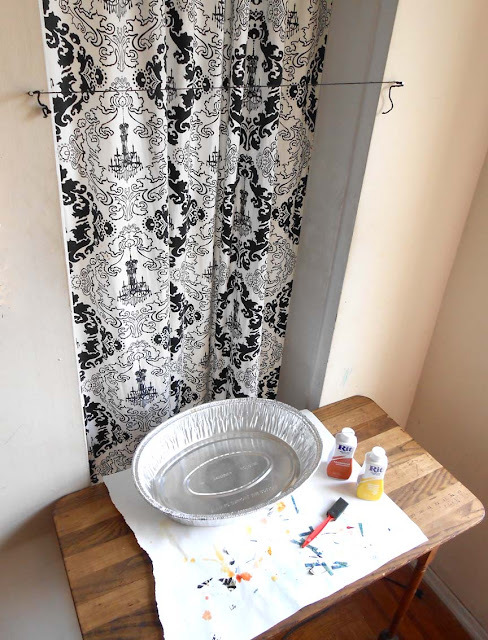 -Set up a well covered table with an aluminum pan large enough for both holding the dye and catching the drips. 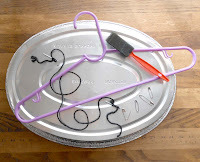 -Next, string up a makeshift clothesline across a doorway. 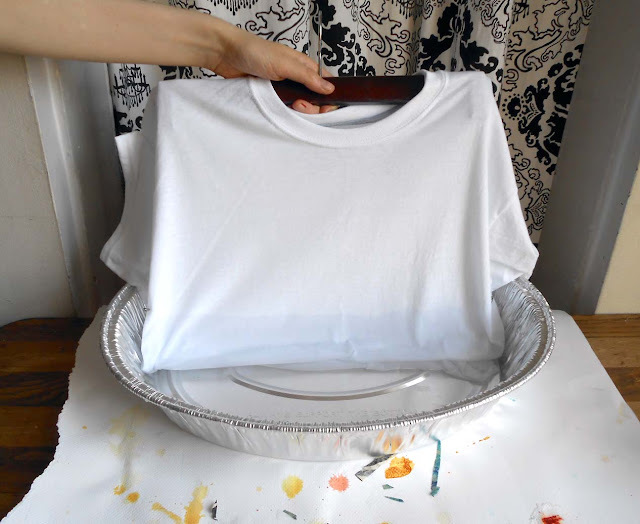 It should be the right height for the shirt bottom to be just above the pan so it can drip into it. Step 2: Decide how far up the shirt you want the two colors to go. 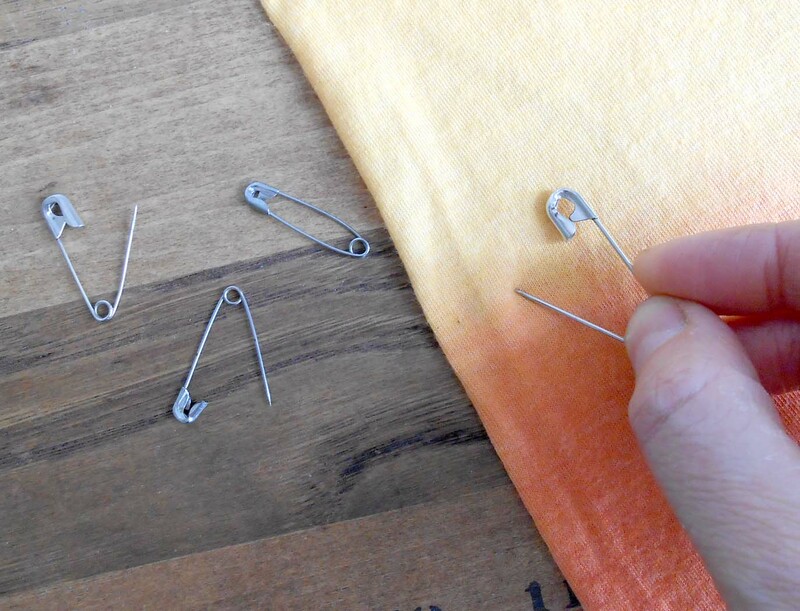 As evenly as possible, pin the first two safety pins across from one another at the height where you want the yellow to end. 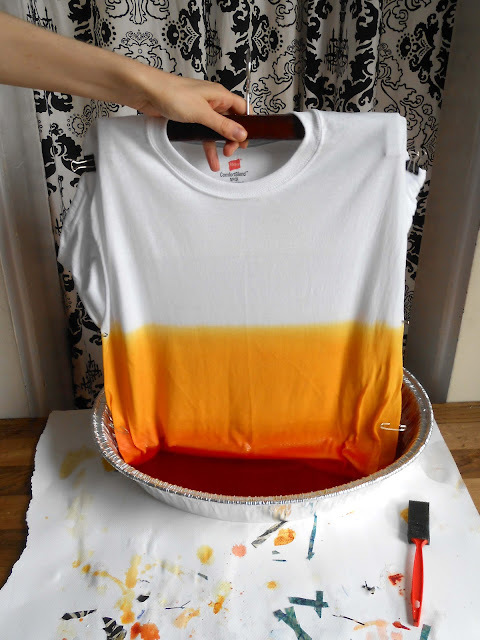 Do the same a little lower down the shirt for the orange, using your last two safety pins. This is also a good time for pinning the sleeves out of the way. When you're done with this step, your shirt will look like this. 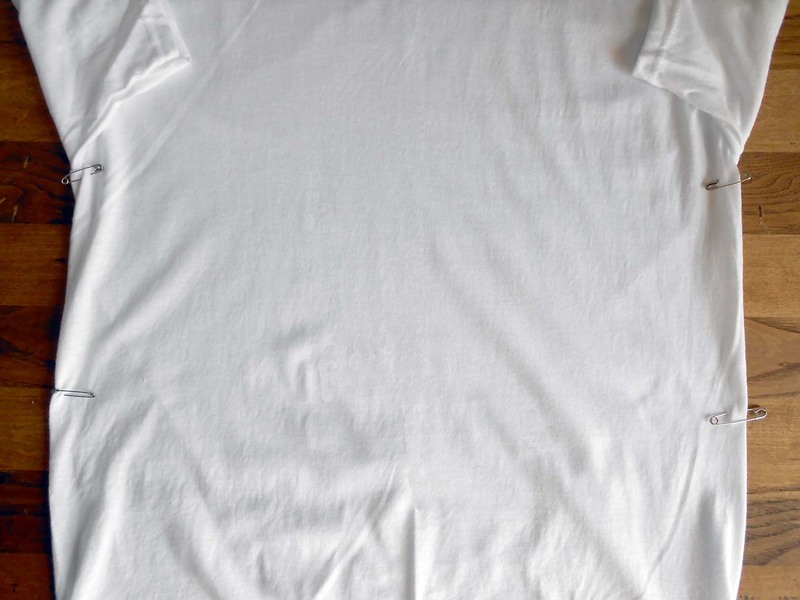 Step 3: Wet the dying area by dipping shirt into warm water till just below the top safety pins. Step 4: Dip your shirt into the yellow dye, stopping when you get to the the top two safety pins. 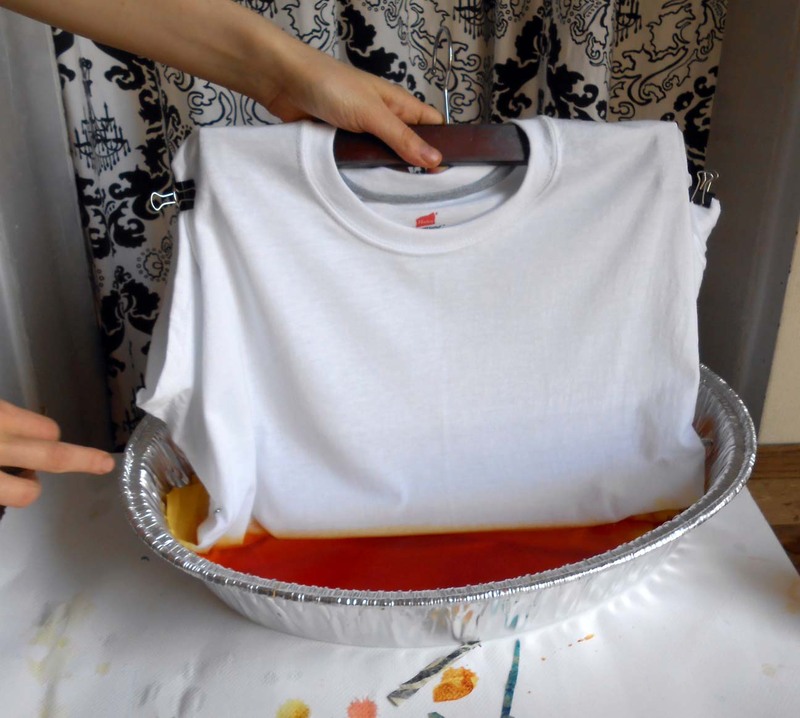 Because the dye will dry to a lighter color, you may want to repeat this a couple of times so the shirt looks as bright as possible. When you're satisfied with the color, let it hang over the tray for 15-20 minutes so that some of the excess dye can drip off into the dying pan. 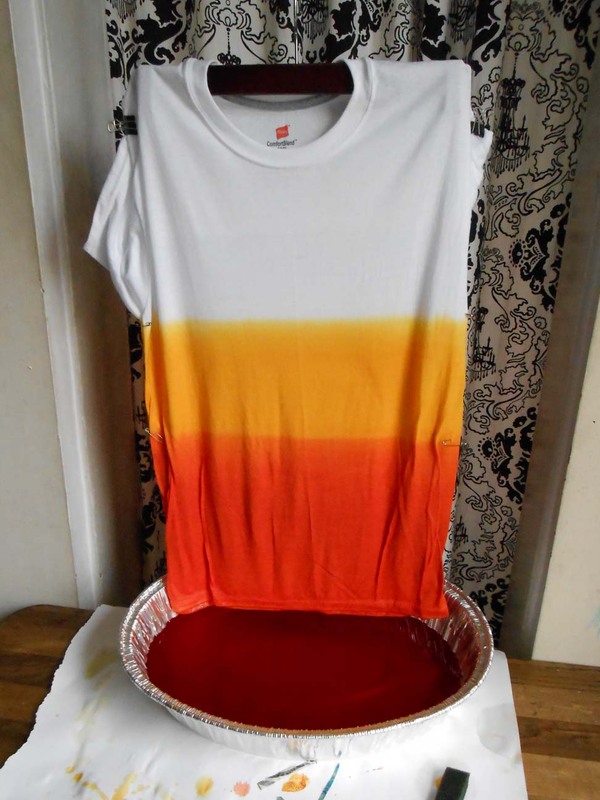 Step 5: Change out the dye in the pan to the orange and repeat step 4. This time only dipping the shirt up to the bottom two safety pins. Again, dip a number of times to have a brighter colored orange. Step 6: Let the shirt hang for a little while before rinsing so that the dyes will be less likely to seep into othre areas. 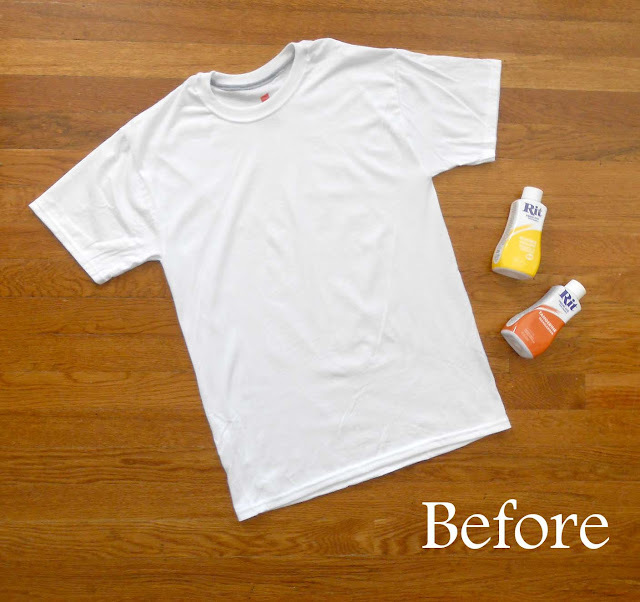 Thorough rinse the shirt until the water coming off of it runs clear. Step 7: When you're all finished remove the safety pins and let dry. Hope this is a good solution for someone who waited to till the last minute to pull something together. Be safe in this hurricane, East Coast friends! And Happy Halloween!